Hey guys! Happy start of the weekend (and for some lucky souls, Reading Break)! 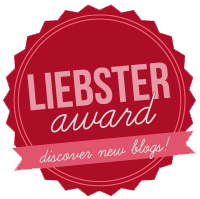 The lovely Athena of Glimpses of A has nominated us for a Liebster Award - so exciting :-) We had to write 11 facts about ourselves and answer 11 questions, then nominate 11 bloggers to write 11 of their own facts and answer a new set of questions of our choice! 1. 11 facts about yourself. 2. Answers to the 11 questions the person who nominated you has provided. 3. Provide new questions for bloggers you nominate the award to. 4. Choose 11 bloggers with 200 or less followers to nominate the award, and link their blogs. 5. Contact each blogger via whatever network you like and let them know you have nominated them. 6. Thank the person who nominated you and link their blog. Sounds fun, right?! Soooo here goes! 1. My legal first name is Alison, but when I was about 5 or 6 I 'changed' it to Alexandra because there was another Alison in the class and I hated having the same name as her! Somehow it stuck, although pretty much everyone calls me Ali, which can handily be short for either name. 3. I have terrible eyesight. 4. I had braces for a year when I was 19/20, which was awkward. 5. My hair has been pretty much every colour at some stage or other (blonde, black, brown, orange...I even managed to -accidentally- dye it grey one time. It's now back to its natural brown though). 6. I used to have a sweet rather than savoury tooth but it's now the opposite, for the most part. I'd far rather have a slice of pizza than a slice of cake. 7. I was born in Ireland but moved to Canada when I was 3. 8. I've lived in 4 countries, 7 cities/towns, and 16 homes. 9. My claim to fame is that I 'starred' in a film with Farrah Fawcett when I was 14. But it was just a super minimal extra role in a made-for-TV movie called 'Hollywood Wives: The New Generation' that no one has ever seen or heard of. 10. I don't have one favourite colour (I like all the colours!) but three of my all-time favourites are mint green, lilac, and cobalt blue. 2. Because of #1, I am a vegetarian! 4. I would like to rival Ali's awkward braces fact by pointing out that I had braces in grade 11 and 12 (got them off 2 days before graduation) and most of that time was spent waiting for a canine tooth to grow in!! VERY few pictures were taken during this time! 5. My chihuahuas Lulu and Chichi are like my children - my Instagram is basically devoted to them! Chichi sleeps on my bed every night and her loud snoring bothers everybody but me! 6. Though I am in no way, shape, or form an Adele fan, I aspire to have eyeliner as perfect as hers! 7. Winter is my favourite season (see #3!) and Summer is my least!! I can't stand anything hotter than 20 degrees, I don't swim (not because I can't - I just don't like it! ), and I only burn in the sun so there's really nothing to like! 8. When I started university I wanted to go to medical school. Since then I have considered business, clinical psychology, and organizational psychology, but now I've decided on fashion merchandising or buying! 10. I change my nail polish colour at least once a week - as soon as I get one chip I'll change it! 11. I love travelling and have been to 17 countries so far! I would LOVE to see Greece or anywhere in Asia next! 1. How much time do you need to get ready in the morning? A: A lot! I wash my hair nearly every day and it takes FOREVER to dry. (Not to mention straighten/style). In an ideal world, I'd have a nice, leisurely hour and a half to get ready, but as I'm definitely not a morning person, sleep usually wins and my appearance suffers! V: I always set my alarm so that I have a perfect 2 hours from the time I wake up to the time I leave the house! On a good day it takes me an hour but I allow extra time for days when my winged eyeliner just won't match or I need to try on every single item of clothing I own before deciding on an outfit! 2. What is your favorite ice-cream flavor? A: Anything chocolatey...DQ's Brownie Batter Blizzard is my current fave. V: Mint chocolate chip! Actually, absolutely anything and everything that doesn't have caramel in it! 3. Would you rather be able to Stop Time or Time Travel? A: Time Travel! Hands down!! How amazing would that be?! V: I agree with time travel!! 4. One thing in your room that couldn't do without? A: My bed! Haha other than that...my laptop? 5. What is your 'statement piece' referring to fashion? A: Hmm...not too sure about this one. I wear a lot of dresses and skirts though - I have about 50 skirts and only 2 pairs of jeans! And I like interesting tights. A: Getting my BSc in Psychology. 7. All time favorite book? V: I'm honestly ashamed to say that I almost never read anything besides my textbooks! I started reading The Tenant of Wildfell Hall (at Ali's recommendation) in June and didn't finish it until December but I enjoyed it! 8. What you'd most likely say to avoid a date? V: I agree with Ali, just keeping things friendly is the easiest! 9. Top 5 songs listening to at the moment? A: Both! Coffee first thing in the morning and tea throughout the rest of the day. Green tea if I'm feeling virtuous (which is rarely). V: As much as I appreciate the idea of it, I just can't make myself like the taste of coffee! I do love hot chocolate though! 11. What is your desktop background? A: It alternates between 3 stock images: the Grand Canyon, a dock leading out to the ocean, and a forest. Boring, I know. V: This ADORABLE pic I found on Pinterest! 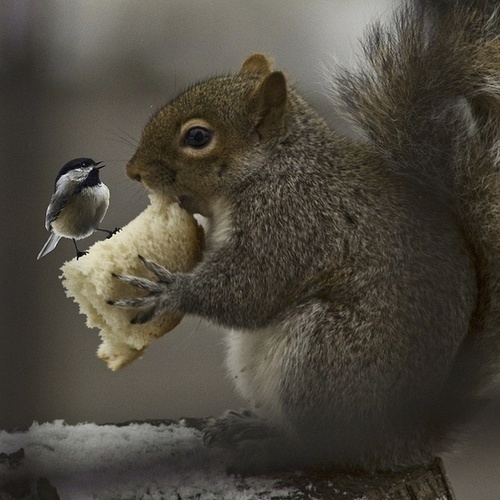 It flawlessly combines 4 of my favourite things: birds, bread, snow, and rodents holding things!! And here are our 11 Questions! 1. What's your favourite Disney movie? 2. What's the one make-up item you can't live without? 5. What's your idea of a dream holiday? 9. Would you rather live in a big house in the middle of nowhere, or a little flat/apartment in a big city? 11. Favourite meal of the day? PS. Mint chip is also my absolutely favorite ice-cream since I first tried it 10 years ago! I don't get why most people don't like it!! Thanks so much for your nomination girls!! my responses are coming this week!